The car that raised the midsize bar arrives for 2014 with a long list of incremental updates and maybe even some real competition. What was an aging pack of so-so affordable mobiles has turned into a genuinely new Toyota Corolla, an enticingly re-done Volkswagen Passat, an all-new deliciously sporting Mazda6 and a tech-savvy Nissan Altima, all in the last couple years. What's a belle of the ball to do but sweeten her perfume? A nip here, a tuck there, and the 2014 Hyundai Sonata looks all the more the luxury part with a front that speaks of grandeur and the distinctive tight rear of a Beemer, but retaining those sharp lines that made it simply impossible not to turn your head and take it all in at your neighbor's driveway, the grocery store, the mall, on the highway and literally anywhere else you got a chance to lay your eyes on one for any length of time. For a while, only its mechanical twin the Kia Optima could claim as much attention in this price bracket—and then came a handsome slew of all-new suitors, most of which are also 2014s. So, rather than simply looking the part and loading on virtually everything but a kitchen sink, Hyundai aims to make its front-running sedan feel just as delectable by including driver-selectable steering modes, additional sound insulation and several noise-cancelling as well as ride-refining revisions in every Sonata for 2014. Early-bird buyers report a serenely soundless cabin with a ride just soft enough to be cozy and a steering response that can be sensitively immediate like a German make (Sport), staidly gradual if you prefer a more domestic feel (Comfort) or a modified slightly less-touchy version of its former years (Normal). Otherwise the usual GLS, SE and Limited trims carry over much the same as they were for 2013, 16.4-cubic-foot trunk and all, excepting a few minor additions that are mostly standard for the SE or Limited variants, but largely also available to the GLS. High-intensity xenon headlights, LED taillights, blind-spot detection and a ventilated driver's seat are newly standard in every Limited and optional only to the SE, however GLS buyers can opt for the newly SE- and Limited-standard 4.3-inch full color LCD infotainment system, rear-view camera, driver's blind-spot mirror and full-leather steering wheel. That said, the Sonata is no longer available with a 6-speed stick, completing its transition to a lone 6-speed shiftable automatic across the board. Engine outputs and economy are also revised lower for 2014, but on the upside, SE buyers opting for the turbo engine also get a sport-tuned exhaust by default. The 2.4-liter inline 4-cylinder (I4) powering all but the 2.0T variants still hits highway speeds in about 8 seconds, but now rates at 190 hp and 179 lb-ft of torque as opposed to the previous 198 ponies and 184 pound feet, dropping urban economy by a couple of miles per gallon for a final figure around 24 mpg city/35 highway. The SE's version of the same engine uses a dual exhaust to squeak out an extra 2 hp and 2 lb-ft/torque with equally negligible impact on performance and economy. Those with a need for speed might want to seriously consider the 2.0T SE and Limited options, which are good for zip to 60 mph in a very competitive 6.7 seconds with 274 hp and 269 lb-ft/torque. Fuel economy is reported as barely affected, down just 1 or 2 mpg. Others with their hands on one call this powerplant's premium fuel consumption closer to 21/32, however. 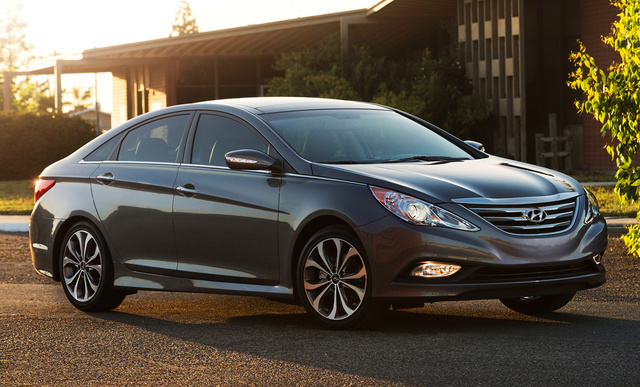 What's your take on the 2014 Hyundai Sonata? suwaneeguy Hey Patricia, I am very curious who those "others with their hands on one" are who are remarking about the Sonata powerplant's premium fuel consumption. The Hyundai Sonata 2.0t does not require premium fuel and gets its rated mpg using standard 87 octane. Making up sources especially when the fake comments are incorrect is not cool. You could be costing Hyundai business by diverting consumers who otherwise would purchase one if they knew it only required 87 octane. Users ranked 2014 Hyundai Sonata against other cars which they drove/owned. Each ranking was based on 9 categories. Here is the summary of top rankings. 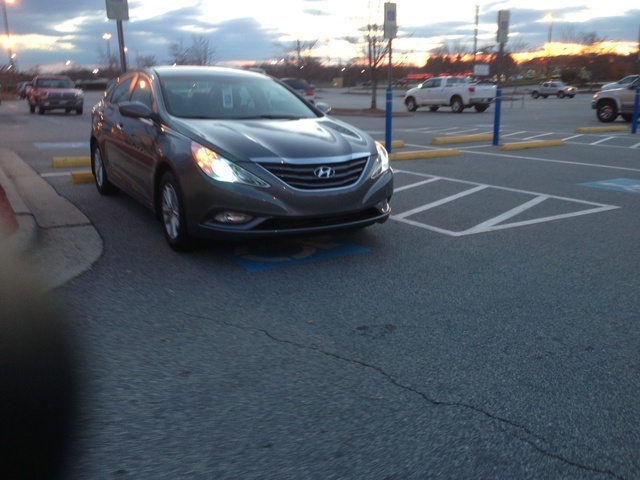 Have you driven a 2014 Hyundai Sonata? Whats Wrong With My Trunk ? Trunk Won't Open. 2014 Hyunday Sonata Trunk won't open when I push the key button or trunk release button in the car. I can hear it clicking though when I push the button. A wire on my negative post was pulled out and the car started dying. How can I put it back on or can it be rewired?